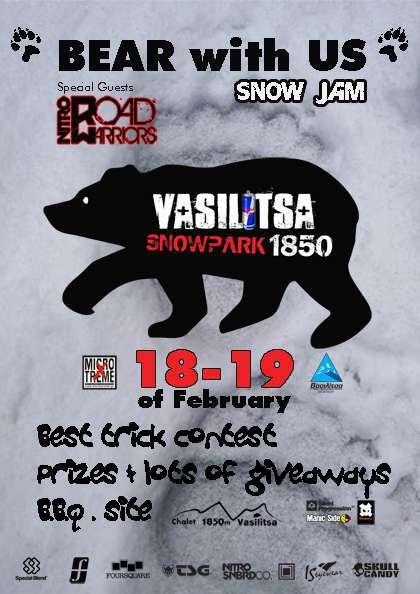 Vasilitsa Chalet 1850 and MicroXtreme presents another pre-Parkoluna snow jam at the fresh redesigned snow park located outside the refuge. It includes best trick contest, prizes and lots of giveaways, B.B.Q. site and an after party at Chalet 1850. In addition, the Bear with US jam will be featuring in the next episode of the Nitro Roadwarriors series. The Roadwarriors team will be on point from the 14th untill the 20th of Feb and consists of Aymeric Tonin, Basti Rittig, Tom Hörhager and filmer Karsten Boyens.